This is one action packed, hands on and informative day of BREWING, LEARING, BEER TASTING, FOOD PAIRING & FUN. The cost of this full brew day is £119.00 including lunch and refreshments and a case of 6 bottles of your home brew. To reserve your place, please order through our online shop. A 10% discount on all Gyle 59 bottled beers will be available to participants on the day. No experience necessary, just come along and enjoy the ride! At last, we have finally resurrected our Home Brew Courses - HOORAH! We have consolidated the two day courses we were previously running into one action packed, hands on and informative day of BREWING, LEARING, BEER TASTING, FOOD PAIRING & FUN. 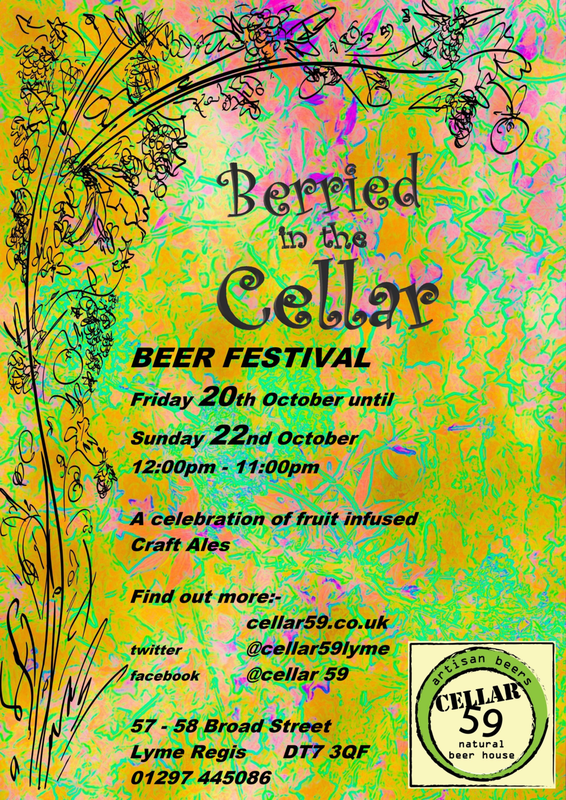 At Cellar 59 in Lyme Regis, an amazing line up of mouth-watering beer all unfined and made in Dorset (exept for our special guests, ex-Dorset brewery Art Brew). Brewsters from around the country will be descending on Marshwood Vale to take part in a collaborative brew on All Hallows Day. We'll be joining our friends at River Cottage for their Summer Fair and selling a range of our bottled beers to visitors. We are likely to be doing at least one talk about beer & food matching so keep a look out for it in the Summer Fair Programme. As part of STIR to Action's programme of workshops this year we are delighted to be offering this day of demonstration and discussion of brewing tehniques for home brewers. We're supplying some of our beer to the hedge laying competition this year as we believe that this may be thirsty work (for entrants and spectators alike...)! We're also sponsoring the Novice Class and taking a keen interest in this popular event. With our brewery being in the heart of rural Dorset we're only too aware of the effort that has to be made by the farmers and land owners to maintain the land around us. Come along if you can it should be a great day out! It's being held at Yonder Ridge Farm, Stockland EX14 9EW - Just head for the Stockland Mast and you'll find it. We're off to London again to serve tasters of our Toujours Saison and The Favourite Porter to the lucky attendees of this pub industry trade show. Our good friends at Thorncombe Village Shop have invited us to hold a beer tasting event in their cosy, well stocked premises. We'll be there, along with a selection of our beers, to offer tastings and suggestions for beery Christmas gifts. This will be the first opportunity to buy our Christmas Special - a subtly spiced pale ale to help your festivities go with a swing! Come along if you can, meet brewster Emma and enjoy this quirky event! The friendly folk at The Anvil Inn in Pimperne are holding a small beer festival and including our Dorset GIPA amongst the ales on offer. Drop in and have a pint or two if you're in the area!